How To Construct Blog Links? ~ The Blog Doctor. You are here: Home > URL > How To Construct Blog Links? How To Construct Blog Links? A Link on a web page is a word/set of words/image which when clicked on using a mouse brings up another web page/resource. It is also called as a hyperlink. Here just change 'YOURBLOGNAME' to actual name of your blog and 'blogspot.com' is the domain. To go to this site just copy and paste this URL into the AddressBar of your browser and press Enter. This particular URL will not go anywhere since it is a fictitious site. Notice that it consists of the blog url followed by year and month of publication and then followed by post title. The URL of a post is called the Permalink. The timestamp of each post at the bottom of each post is also linked to the post URL. 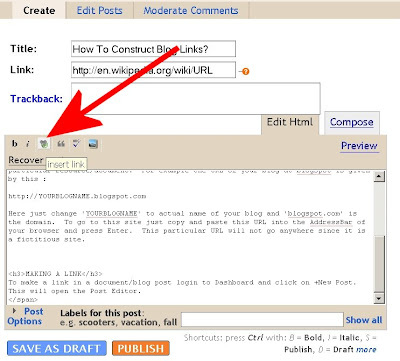 In New Blogger all posts have their Permalinks enabled by default. A new window pops up. In it type/paste the URL of the webpage you wish to link to and click OK. When you publish the post you will see the words you had selected in link form and clicking on them will bring up the web page whose URL you had used. 1. Open your friend's blog in browser. 2. Copy the blog address/link/URL from the address bar. 3. Login to Dashboard and click on +New Post. 4. Type your friend's name in the post editor and select it. You can also type in the name/title of the blog. This is also known as the 'Anchor Text' for the link. 5. Click the link icon in the top frame and paste the URL from Step 2 in the popup window and OK it. 6. Publish Post by clicking Publish button. 7. View Blog by clicking on View Blog tab at the top and test the link. The 'TITLE OF PAGE' is the anchor text of the link. See How to make anchor links which lead to another place in the web page. See How to make Image Links. The Link List widget is used to add a list of links to the sidebar. See How to add widgets to your blog. You need the URL for your sites and their Titles before you add them in a Link List widget. Links by default open in the same window. You can change that to open in a new window. This enables your blog page to constantly remain open in the viewer's browser. To make Email links and mail-to links you can use either images to prevent spammers from stealing your address or code. Dear I have a query.. Its confusing .. When i tried link:http://inside-n-outside.blogspot.com in google(finding back links) then its saying no links found..
when i tried google webmasters its able to find around 300+ links.. what is happening? another is related to Page Rank. I was in PR 1 and one day my blogger crashed.. I changed the template to save it(some kinda funny error xb-XXXX) and now my PR is 0 why? how can i increase the same? New word today boys and girl HYPERLINK! I can't buy you a beer, but your info was most helpful! When Lethe first came to her about his problems she told him a story about her childhood. I remember when I was a little girl my mother removed me from school. I figured it out. Thanks for the fantabulous website. What a godsend! Thanks so much Vin - we newbies really appreciate it!!!!!!!! Hey, Could you provide steps to make an internal link...that opens to a new page within my blog!! 3. Get the Permalink of the Post. I will start using some of these. And I'm bookmarking this page; I know I will be coming back to it a lot! I'm can't seem to figure out how to create a non-html link. I'm trying to post a simple word document onto my blog but don't know how! Can you help me? Have a look at How to put pdf, excel, docs in your blog? I use your site a lot because I am new to blogging and want to do all I can to improve my site. I can't figure out how you got all those navigation buttons up at the top of your page...how did you do it? Thank-you for a very helpful site! Have a look at CSS navigation Labels in Post Book in New Blogger. Thank-you so much! I now have tab links at the top of my blog! Yay! could u plz help me...yest: i added my freinds link address...but it didnt come out. when i went bck to check the cookies , it still had. i made twice but the same problem i've got. Exactly where are the links? In post or in sidebar? link probelm is at the sidebar.. There are many links in your sidebar. Which link are you having problems with? only two person address will show up, the others were disappeared.. HELP!!! I must be blogger dumb because Im sure I followed your directions but the link doed not show up in my post, theres just a blank space there. Other people have things in their blogs that you just click on and it takes you somewhere but I cant figure out how to do that? In post editor first type the words "inksomething". Then with mouse left click and drag across the word to select it. It will appear with a blue background. I view my blog using Firefox and Google Reader. Unless I click on the title to view the post, the links do not appear i.e. no underlined text but, links on other posts do show. How can I get the links to appear? What is your blog address? Which links are these - in the post or in sidebar? The links in the posts appear just fine at blogspot but in Google Reader, they don't show unless I click to preview. I was hoping to get them to show up everywhere. Perhaps a tag issue? Go to Settings----->Site Feed and set the posts feed to Full and save. Harry here. I could have sworn I had chosen Full in the Settings/Site Feed; I remember reading about and changing it. Anyway, as always, thank you very much. It is working fine now. OMG YOU ROCK MAN!!! Wahooo! I just spent like and hour trying to figure out how to add a hyperlink. Youre a rockstar! Thanks a lot. Very rare person has the strength to educate others so easily. Accept my salutes pls. be blogger dumb because Im sure I followed your directions but the link doed not show up in my post, theres just a blank space there.